AwesomeBooks has over 2 million new and used books in stock at real low prices with free shipping. Get 15% off on your total order when you buy four books or more. 20% off through 3/2/12 or later. AwesomeBooks : 20% off through 3/2/12 or later. AwesomeBooks : 4 books for the price of 3 – bargain bin only, code received 7/17/12 with no expiration date seen. AwesomeBooks : Get 20% off used books. Expires on 04/18/2014. AwesomeBooks : Tap offer to copy the coupon code. Remember to paste code when you check out. Online only. AwesomeBooks : 73% Off Secrets of the Baby Whisperer: How to Calm, Connect and Communicate with Your Baby. AwesomeBooks : Get 15% off on your total order when you buy four books or more. AwesomeBooks : Save 15% on Used Books, CD’s DVD’s & Games. AwesomeBooks : Get 10% off. AwesomeBooks : Get Extra 10% Off 3+ books by Charles Dickens. Valid on Used and Bargain Bin books only. Ends soon. AwesomeBooks : 10% of 3+ used or bargain bin books. Expires on 01/11/2014. AwesomeBooks : Get 15% off 10+ used and bargain bin books. Expires on 04/27/2015. AwesomeBooks : Get 10% Off All Used Books in Romance Section. Expires on 02/22/2014. AwesomeBooks : Get 10% off 5+ used and bargain bin books. Expires on 04/27/2015. AwesomeBooks : Buy 4 books, Pay for 3 ! 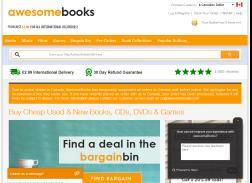 AwesomeBooks : Get 10% off used and bargain bin books. Expires on 11/30/2014. AwesomeBooks : Get 15% off. 20% Off Used and Bargin Bin books through Christmas or later. AwesomeBooks : Get 20% Off Used and Bargin Bin books through Christmas or later. AwesomeBooks : Get 10% Off 5+ Used books, CDs, DVDs & Games purchase. One Use per customer. Not valid on New Books, Bundles or Box Sets.